But let me rewind a bit. Last week we were invited to our Egyptian friends house. There we were offered a taste of a land I know very well and have missed ever since my last visit. It brought me back good memories of bustling Cairo, cruising the Nile, eating with the Bedouins in the desert and exploring all the marvelous ruins, tombs and pyramids, reminders of their glorious past. Spices are essential in the Middle East and cardamom is widely used throughout the region. But Cardamom has such a wide use, in meat dishes, in vegetables, in sweets, even in hot chocolate. My friend generously offered to get me good quality Egyptian cardamom and other spices at our local farmer’s market which opened up a range of possibilities in my mind to cook Middle Eastern dishes again. But my mind had been also busy with some bad news. The kind you never want to hear. The possibility of soon losing a friend shocked me. There are friends whom you consider true family. I’ve said time and time again that blood is important but is not everything and there are people who come into your life and touch you so profoundly that you can’t bear the thought of losing them. I met my Egyptian friend again on a gray, sad day when I was feeling a bit down. We talked about our lives, being an expat away from your country and family is very difficult at times. That is why we cherish the people that come into our lives and make us feel we are part of their family and stick with us no matter what. These are people we never want to say goodbye to. But on that day besides comforting me she came bearing gifts, the promised spices! When I opened the cardamom at home and smelled it, it brought me back to Middle Eastern landscapes. I knew I wanted to cook something sweet, a contrast to the bitterness of an impending loss. At the same time whatever it was, it had to take that wonderful cardamom which had been generously offered in a day I had needed to be comforted. I found this wonderful recipe in the appropriately “Food of Life” cookbook by Najmieh Batmanglij. She is considered as one of the great experts on ancient Persian and Iranian dishes (you can also try her Carrot Halva). I adapted the Baklava recipe to fit what I had in my pantry. Combine all the ingredients of the glaze in a saucepan and bring to a boil. Stir gently for a few minutes. Remove from heat and set aside. Preheat the oven to 180 ºC/350 ºF. Grease a 24 cm/9 inch springform cake mould with butter and line the base with parchment paper. Then butter and dust the top of the parchment paper. Whisk the egg yolks and sugar until creamy and smooth. Add the cardamom, rose water, milk, oil and whisk for 1 minute more. Add the flour sifted with the baking powder, the pistachios (or almonds) and apple and fold with a rubber spatula. In a separate bowl whisk the egg whites until there are soft peaks. Then fold carefully into the flour mixture until you have a smooth batter. Don’t over do it. Pour the batter into the cake pan and bake for 40 to 45 minutes until a tester or toothpick comes out clean. Remove the cake pan from the oven and place it on a cooling rack. Pour half of the glaze over the cake and leave it in the pan until it absorbs all the syrup. Release the cake from the pan and transfer it to a serving plate. Cut the cake into diamond shapes. 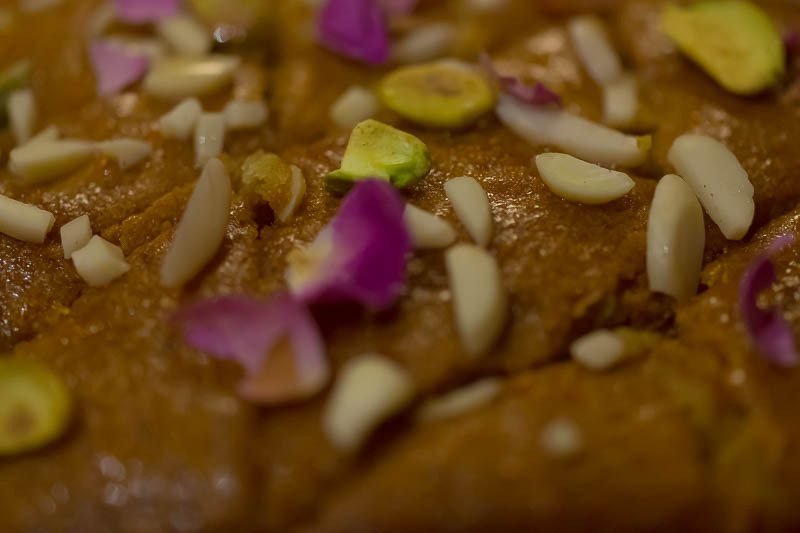 Pour the rest of the glaze over the cake and decorate with the pistachios, almonds and dried rose petals. The dried rose petals I bought in the Iranian Pavilion at the Expo Milano 2015 really came in handy! What to say about this cake. It is for sure one of the best cakes I ever did. The honey gives the glaze just the right amount of sweetness. 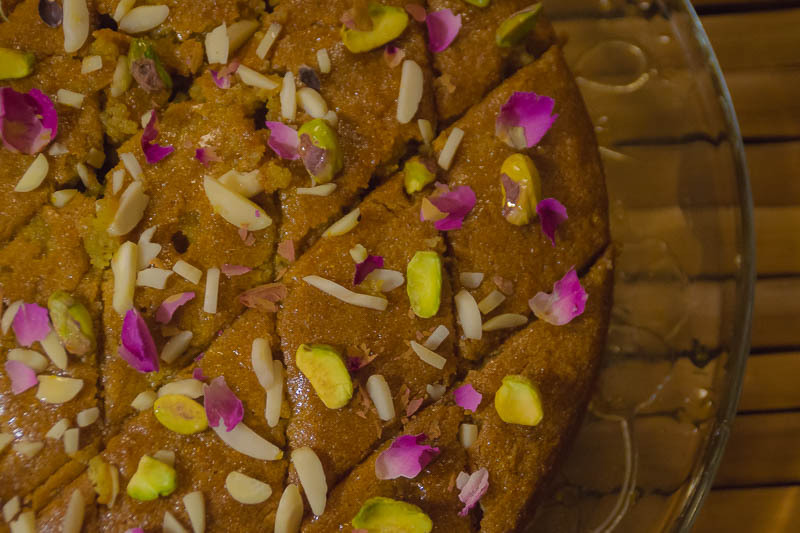 The cardamom, nuts and even the rose petals elevate it to something very special. My heart is still aching because of the impending loss of a very special and dear friend but it is also grateful for every happy moment we spent together and grateful for new friends like Iman who brought me comfort and spices to brighten up my life. This is for both of you! Maria, i just made this lovely Baklava cake! Everyone loved it.. Even the kids! 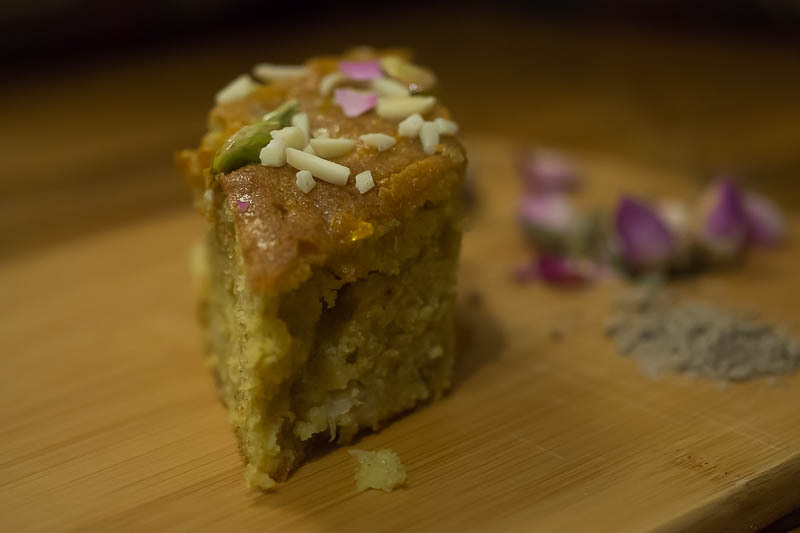 It’s so soft & the combination of flavors are delicious..
That makes me very happy Iman, it is one of our favorite cakes. Great that the children enjoyed it too!